Purchases limited to official Law Enforcement Officers only. 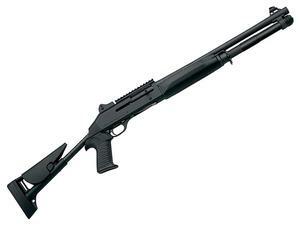 The M4 Tactical shotgun is the combat service shotgun of the U.S. Joint Services today. The M4 is a unique, Auto-Regulated Gas-Operated (A.R.G.O.) semi-auto 12-gauge. The metalwork is chrome-plated, anodized or coated with heavy phosphate to prevent corrosion under the most grueling conditions.